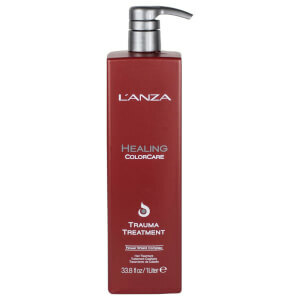 Heal your hair and retain colour pigments with L’Anza Healing Colour Care Trauma Treatment. It’s special system has proved to extend your hair colour up to 107% longer! Trauma Treatment has a revolutionary formula that heals your over processed hair, while its triple UV colour protectors prevent damage and fading. Your hair colour will look rich with renewed radiance. It’s the first product with colour attachment technology, which improves colour uptake, deposition and adherence. Trauma Treatment is ultra healing, leave in prescription to restore your hair’s vibrant health. Regular use of it will improve your colour attachment during colour services and improve colour longevity after you've visited a hair salon. I have used this product for a few years now and wouldn’t swap it for anything else. My naturally curly, coloured hair is very dry. The trauma treatment helps to keep my hair feeling soft and looking healthy. It doesn’t interfere with other styling products I use to retain my curls. Overall a and fantastic product and worth the money. After recently getting highlights in my brown hair it was very dry and straw looking. My hairdresser suggested I use this product and I'm So glad she did. What a difference it's made. My hair is now glossy and the colour much more toned. It feels nourished again. Not only do I use it before blow drying but I also use it as a serum in between. I'd definitely recommend it. I am always suspicious of very positive reviews on a product, but this one deserves them. My long, wavy hair was destroyed by over processing and I was devastated and desperate to get it back into condition. I did a little research and this product came up, so I decided to give it a go. I can't speak for the long term but short term it really does de-frizz and make your hair feel nice again. Now I have to say, I have only had it a week. The first time I used it (actually put a bit on every day for 3 days) it was very happy, but the next time I think I overloaded it. So go with caution and don't think that slopping it on all over the place will be the answer! But I am certainly glad I discovered it and am sure I will buy again: to use in conjunction with oils I apply at night time, my hair might actually recover! I've stopped using it for a few months because I ran out and wanted to see how my hair would be when I don't leave a treatment in when washing.... I've gone back to it time and time again and I definitely can't live without it, well my hair can't! Keep it strong, less hair fall out / less breakage and less split ends! Absolutely staple part of my hair routine!! Only use a tiny pea size amount as too much can be heavy on the hair... I prefer adding it on to my wet hair with Lanza Neem plant Serum!! My hair has been suffering since I've run out... cannot wait for them to arrive again. I was very aware before buying this treatment because of my bad experience with hair creams. Probably most of them end up unused because of leaving my hair sticky and flat. Not this one! After one use I cant imagine my blow dry without this miracle worker. Leaves your hair soft and full of life. A little goes very long way. Must have if you wanna have shiny bouncy hair. My hairdresser recommended this to me, and I didn't buy it for a while because it was so expensive. However, I took the plunge and I have to say, its amazing and well worth every penny. I'd had my hair highlighted twice within 8 weeks (from brown to blonde took a few goes) and it wasn't as soft or shiny as it once was, so this product has really made a difference! I use this in conjunction with the shampoo and conditioner, and highly recommend them too. Have used this for a few years now. A must for coloured or chemically treated hair. Loks expensive, but you only use a little so a bottle goes a long way. I have used this for about three years now. A very small amount through damp hair makes it so much sleeker and healthy looking. One bottle lasts a long time.